Fotospeed CD-11 & CF-41 machine chemistry is comprised of a developer/replenisher and a fixer /replenisher and are supplied as a liquid concentrates. These chemicals are intended for use at normal rapid access processing temperatures (30-32°C) where fully processed and dried prints can be viewed about 70 seconds after feed in. At machine processing temperatures CD-11 developer gives similar speed, contrast and quality to that expected from conventional tray processing. However, as a system designed to be replenished, it may be used for several months before being replaced with fresh solutions. 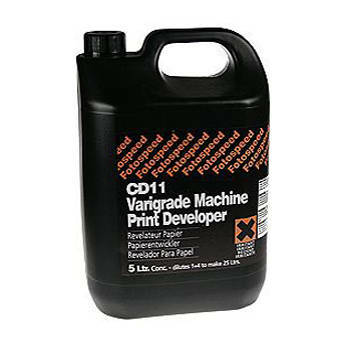 CD-11 and CF-41 are also available in a 1 liter concentrate for in use in Nova Slot and Durst Printo processors where the advantages of fast black & white print processing are desirable, but the requirement for 5 liter concentrates are not. Box Dimensions (LxWxH) 11.0 x 7.5 x 5.4"